A travel case made to transport still-hot curling wands and straightening irons. You packed, you primped, and then you ran into a problem: how to stow a hot hair styling tool in a suitcase full of potentially burnable belongings? 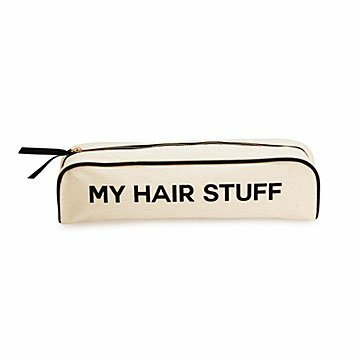 Designed specifically for the coif-conscious traveler, this elongated travel case is designed to hold two styling irons and cheekily printed with the words "Hair Stuff." The best part: it has a heat-resistant lining, so you can confidently take a warm wand to those tresses right up to takeoff time. Made in China. Keep wires and chords away from hot surface contact. Excited to find this tool case! I have looked for a hot hair tool case for travel and have not been able to find what I want until now. Love it.